Sorting Trouble 3 is a Side Quest in NieR: Automata. "The person in charge of the storage area has disappeared. A friend claims he went out to the desert camp to make a delivery and never returned. Put on your detective hat and figure out what happened." "The person in charge of the storage area was stuck... in a storage facility. His supervisor had torn through the place like a tornado and ended up boxing him in. After he was rescued from his package predicament, the supervisor arrived and began teaching him how to organize packages more efficiently through the art of wanton destruction." This quest becomes available on your third playthrough, after the Loss quest has been completed. You must have done Sorting Trouble 1 and Sorting Trouble 2. Go to the storage area and talk to the Resistance Member here. He will tell you the other worker is late coming back from a delivery, and mentions a woman in the desert may know. Go to Desert: Camp and talk to Jackass. Talk to the resistance member and he will exit. The supervisor will then be revealed to have been Jackass, who tells him he should blow up anything in his way. After the conversation you will receive your reward. the guy just dont move even though all the box i cleared, why???? 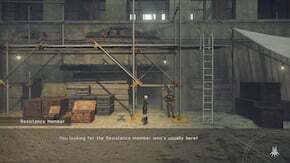 Talking to the resistance member inside the puzzle area may be blocked even after clearing the enemies inside, eliminate any machines on the surrounding rooftops and street level and it should be unblocked.